Translating any webpage to your preferred language is not that hard as it seems. We can uncomplicate this complicated task using Microsoft Translator. This tool is now available as a bookmarklet for your browser. This tool can translate any webpage to your native language. It automatically detects the language used on a webpage and then re-displays the page with all text translated to your language. The tool can translate the page from a variety of languages like English, Nederlands, Deutsch, French, Indonesia, Italiano, Polski, Portugues, Espanol, Arabic, Chinese, Japanese, etc. 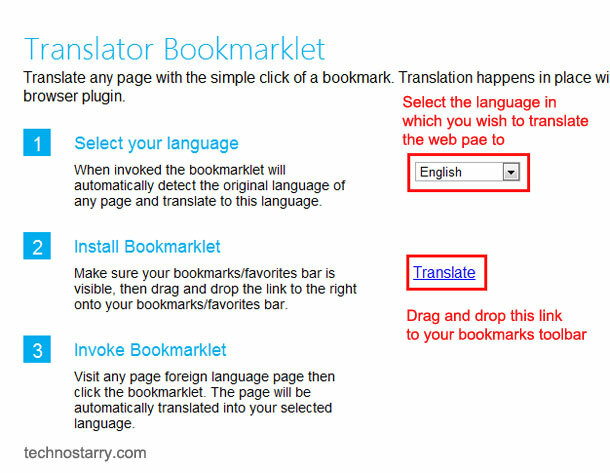 To install this bookmarklet, visit the official site and select your native language from the drop down list. This is the language you wish to translate the webpage to. E.g. if selected “English” from this drop down menu, then this tool will automatically detect the original language of any page and then translate it to English language. Now its time to add this bookmarklet. Make sure that bookmarks/favorites bar is visible and then drag and drop the link onto your bookmarks/favorites toolbar. You’ll see a new icon named as Translate. The process is complete. Now when you want to translate any web page, just click on that “Translate” button from toolbar and you will see that the same web page is translated to your preferred/native language. We can also use our tried and tested tool – Google Translate for this task. But if you’re thinking to try out a new tool for translating webpages on the fly, then Microsoft Translator is definitely worth giving a try. Consider Microsoft Translator as a Google Translate alternative.